It’s coming closer! This years Icinga Camp Berlin will take place on 14th March and we’re excited to publish the first confirmed speakers. The agenda includes a great bunch of talks from experienced Icinga users. The topics vary from integrations with Elastic and the HashiCorp Stack, reports by professional Icinga users about their challenges and best practices from the field. Not to forget about the latest news directly from the Icinga Team about current developments and upcoming projects. Icinga Camps are a great platform to expand your knowledge and learn new methods that enhance your monitoring experience. Besides the planned program, Icinga Camps function as a meeting point for monitoring enthusiasts from all areas. The early bird tickets are already sold out, but you still have a chance to get a regular ticket. 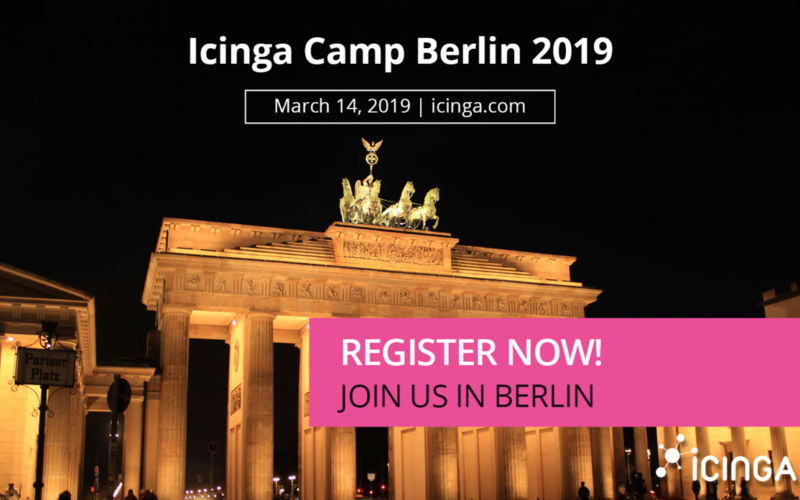 Get your Ticket for Icinga Camp Berlin 2019! You’d like to attend an Icinga Camp but Berlin is not within your preferred travelling distance? No problem – we have many more events coming this year. Check out the Icinga Tour 2019.